I can pick out the exact shade of my favorite color in two seconds flat, but picking a color for my walls has me stuck. I read and bookmarked this post a few years ago, which suggested painting your rooms in shades of the same color. I loved the idea then and couldn’t wait to try it out now! I hope this color arrangement will add some more definition to what is ultimately one open space. 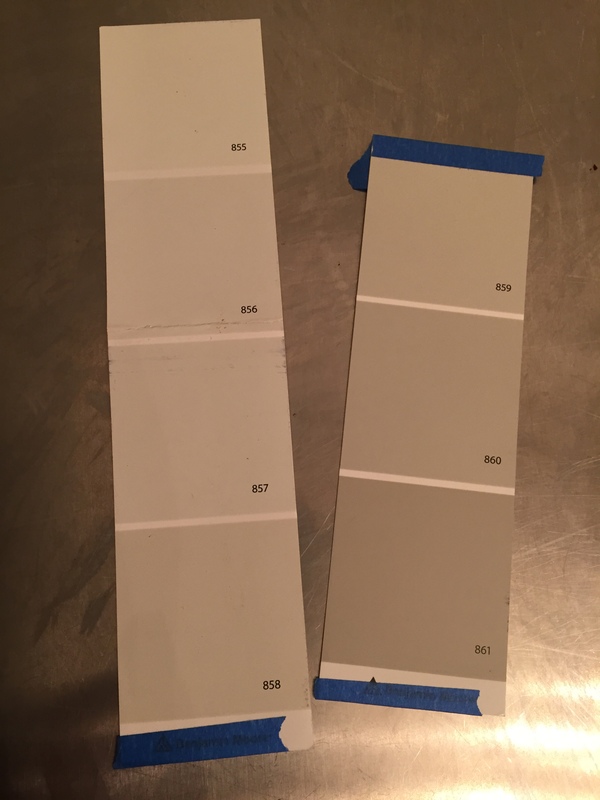 I picked out some paint strips in light neutral colors, and was able to narrow it down to one set, which is basically a long strip cut in half (see how the numbers are continuous?). Yes, technically these strips aren’t shades of the same color but slightly different colors that get progressively darker, but I think the idea still holds. I was stuck on which lighter shade to use for the living room, and which darker shade to use for the entry way, dining area, and dressing room. Luckily it’s pretty easy to get samples made. I actually went back to get an additional sample since I still couldn’t make up my mind! 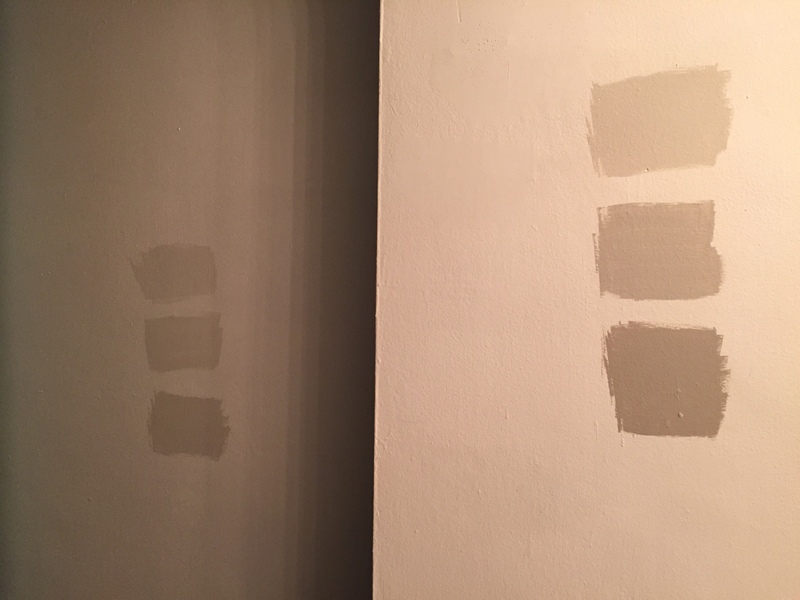 I ended up with three samples painted on the living room wall (left) and three on the dining room wall (right). The paint is from Benjamin Moore, and the colors for the living room are 856, 857, and 858, and for the other rooms are 858, 860, and 861 (listed in order as they appear on the wall). There isn’t much light in my apartment, and the past few days have been cloudy, so it was hard to get a good picture of the samples. Though I can tell you that the color appears very different depending on which wall the sample is on! Right now, I think I’m leaning towards the lightest for the living room (856), and the lightest or middle for the other rooms (858 or 860). One of the best things about living in a big city is that the resale opportunities and deals are endless. I mostly furnished my last apartment from Craigslist, and it seems like the new additions to this apartment will be no different! 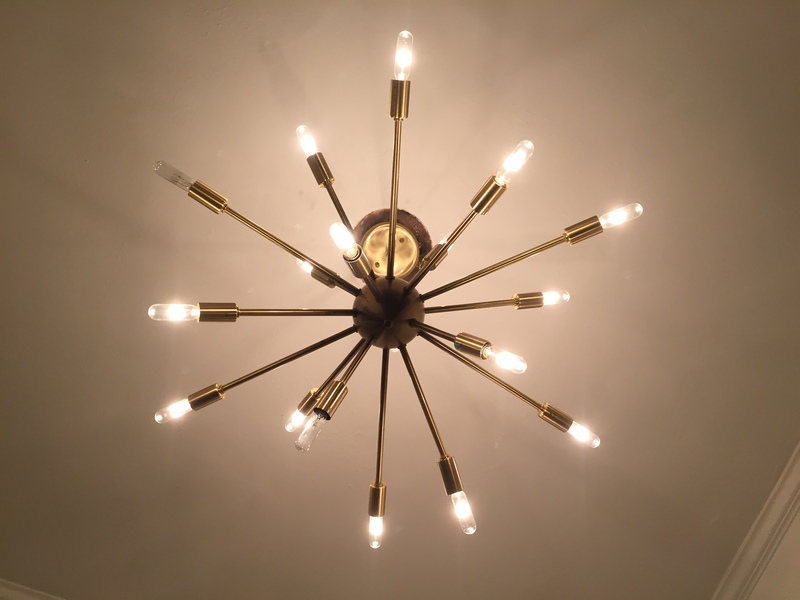 I was browsing for a new light for the dining area and kept stumbling on the Sputnik fixtures. 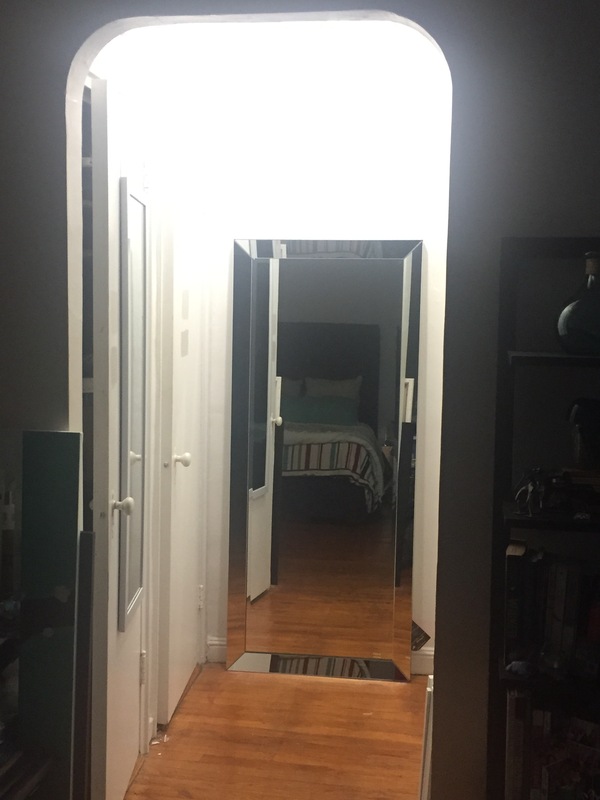 This light was a steal at $100 (with an extra box and a half of light bulbs), and I couldn’t forget it! 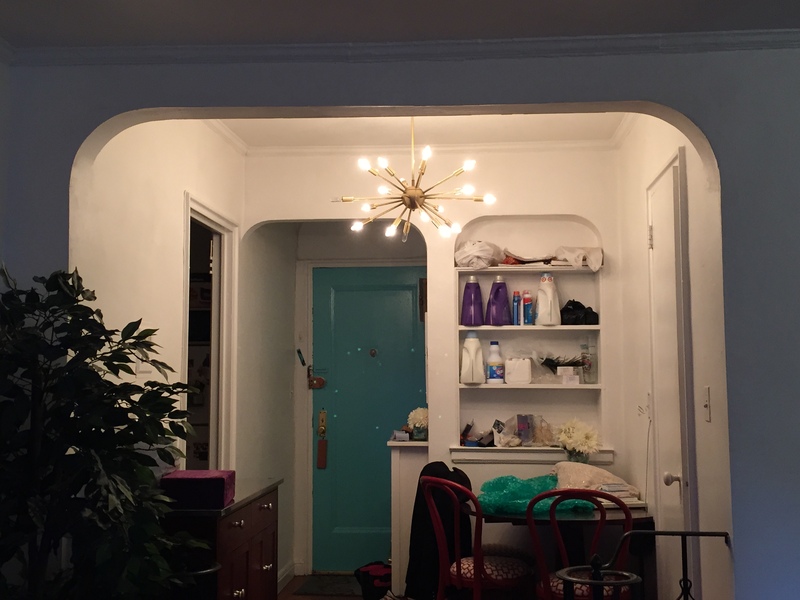 It turns out it’s also famous, as it was recently featured in an Apartment Therapy home tour. 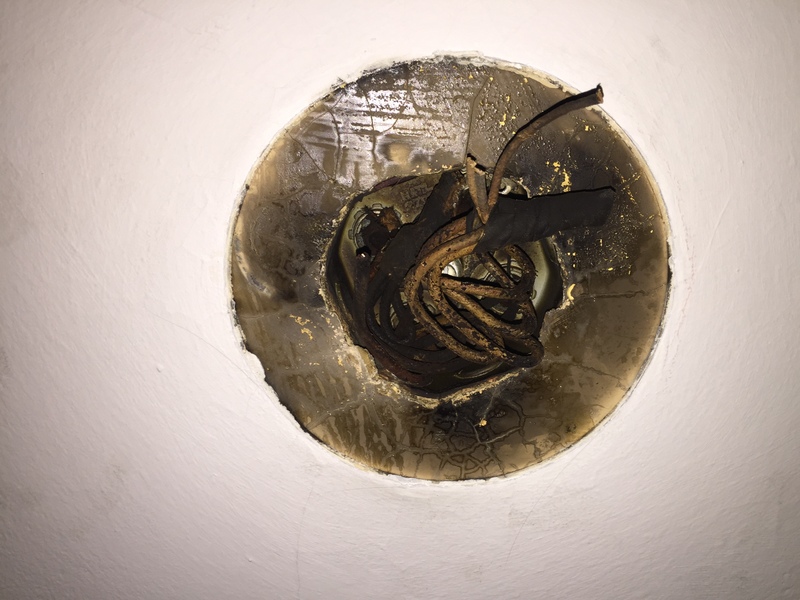 I had tried to install this light myself, but the electrical in my apartment is very old, so I asked the super to help. He came over one morning and began to tinker with the wires. The box needed a crossbar; luckily he had one in the basement. He wrapped it in electrical tape so that it wouldn’t touch any of the exposed wires in the box. I didn’t take many other pictures of the process, as I helped him a little by holding the flashlight and handing him pieces. The “white” neutral wires were cut so that they could be pushed farther into the box. They got a new wire nut in place of the fabric electrical tape. Some of the wires were exposed due to the decaying cotton wrapping, and they were wrapped in electrical tape to protect them. 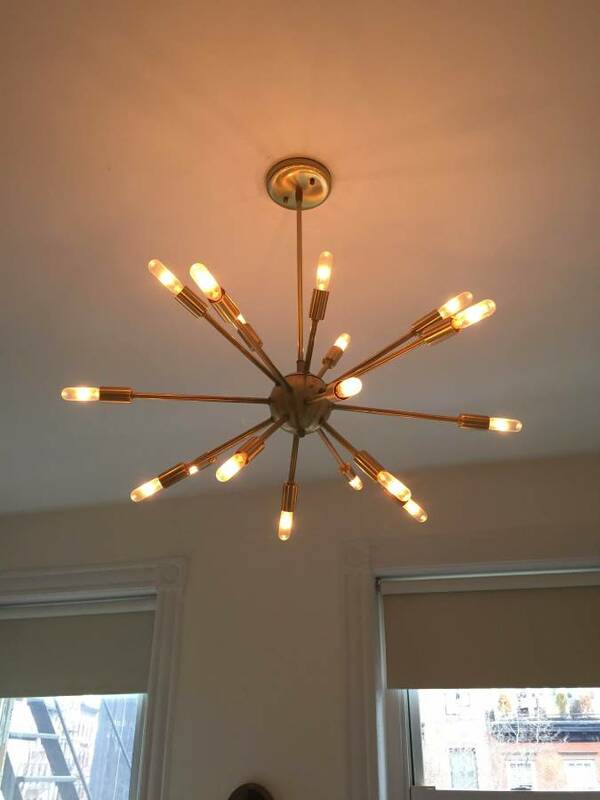 Then it was just a matter of attaching the wires from the fixture to those in the box, screwing the fixture into the crossbar, and then adding light bulbs. And just over an hour later it was finished! 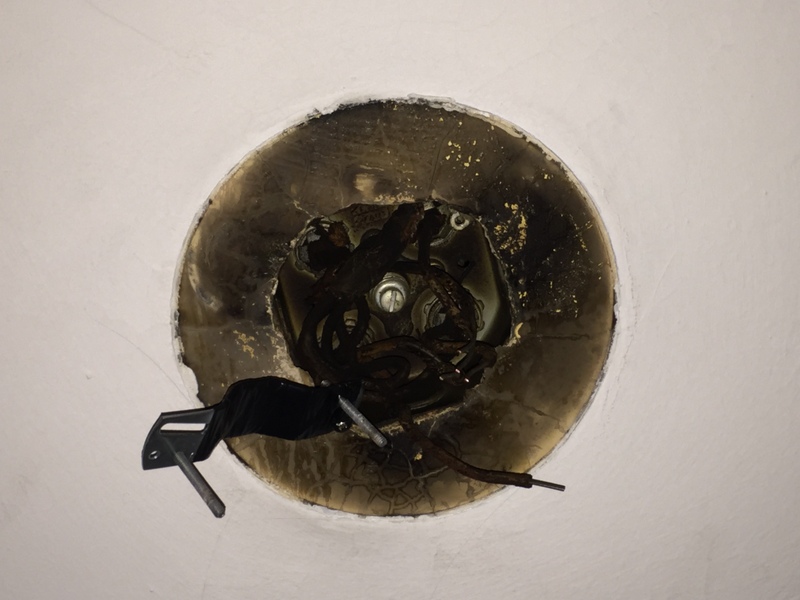 Two of the bulbs are burned out, but I was too excited to replace them quite yet. The old fixture also had a bigger canopy/base, so the ceiling needs a little paint, but that should be easy enough. In the mean time, you can find me gazing at it! My apartment is so fancy, it has a separate dressing room! 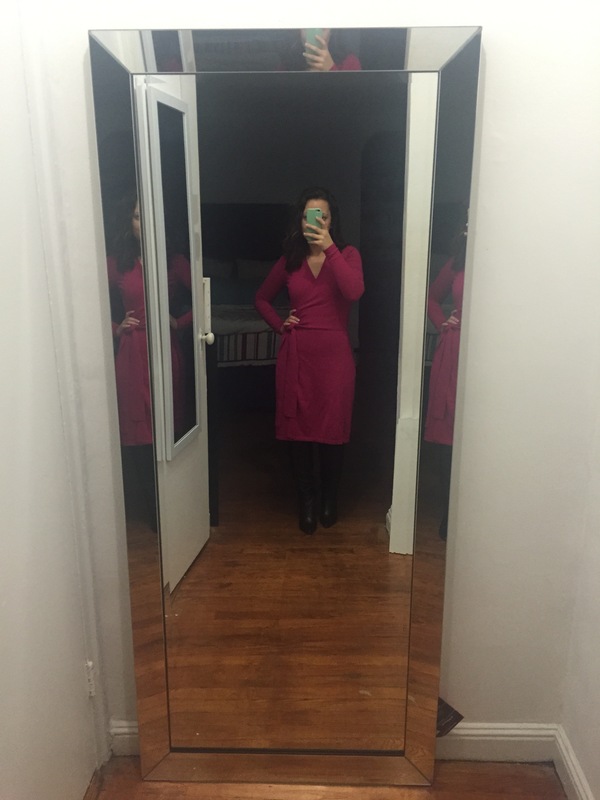 There’s not much space, but as a lady, a room dedicated to dressing needs a mirror fit for the task! 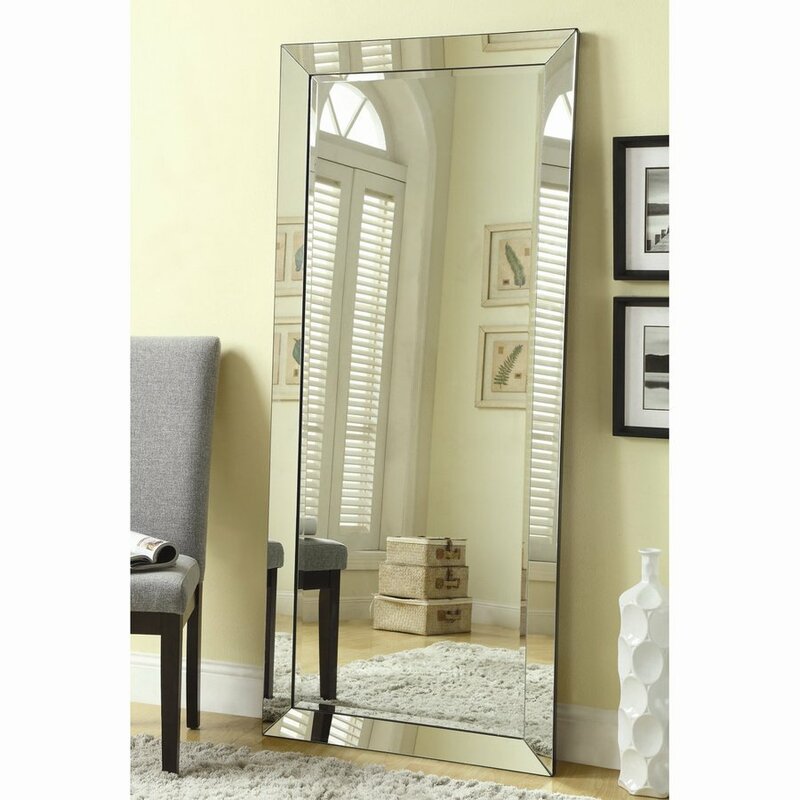 I looked for large mirrors for a few months without any luck. Either they’re too big or small, too expensive, or too difficult to get to my apartment (not having a car means everything has to be taken in a cab–which they don’t like, or a hired man-in-a-van thing). I stumbled upon this mirror at Lowe’s, and it fit all the criteria! I even had a $15 off coupon to Lowe’s because I moved (USPS sends you coupons when you forward your mail). About a week later it had arrived! It feels both big (it’s 2.5 by 6 feet) and small (the doors are almost 7 feet tall) at the same time. The closets in my apartment are unique, because the closets are extra deep. One of the closets already has shelves all the way up the back, with a tension rod in front. It only took a few hours for me to realize that this is incredibly impractical. In fact, I had to remove some dresses just so I could take a good picture of it! The other closet only had one top shelf (tho there are supports for a second, higher shelf) and a normally hung rod. 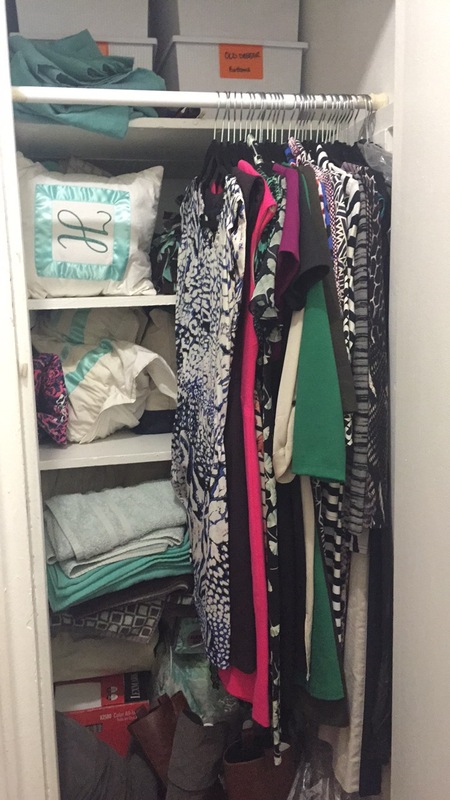 This left about 18 inches worth of space between the door and the clothes–and in a small apartment, every bit of storage space matters! After dealing with the other closet, I figured out that a moving clothing rack would be the most practical solution, since it could be rolled out of the way to easily reach the shelves behind it. 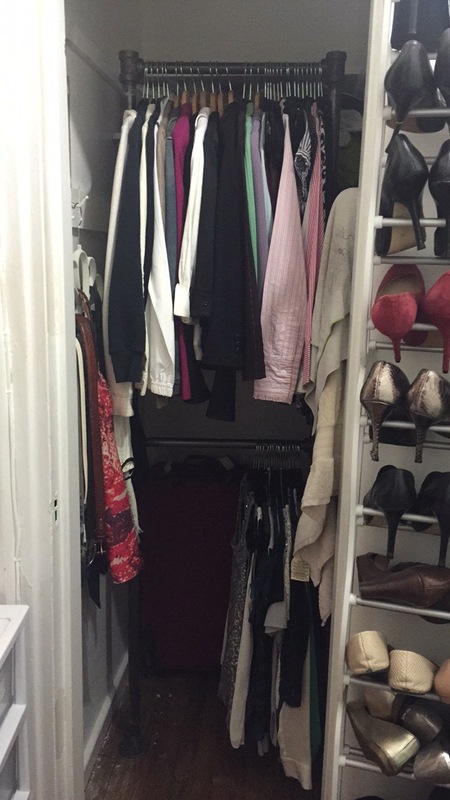 However, most garment racks are larger than my closet, which is just two feet wide. Also, since the other closet is for dresses, I wanted a double rod to hang more short items like shirts and skirts. So like any good DIYer, I decided to make my own! 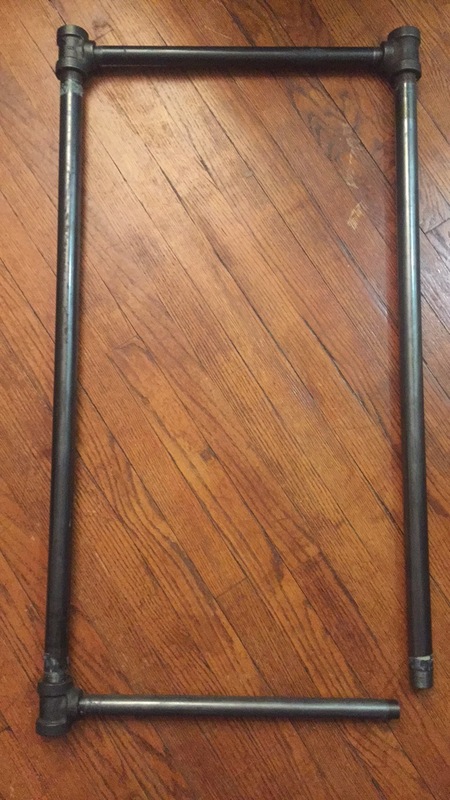 There are a lot of posts about how to make your own garment rack on the internet, but these two (this and this) caught my attention as being some of the few with two rods instead of just one. I had browsed prices at Lowe’s and Home Depot, and those prices were pretty comparable to the prices at the hardware store before the 50% discount. This project wasn’t exactly cheap, but it could have been much more expensive. 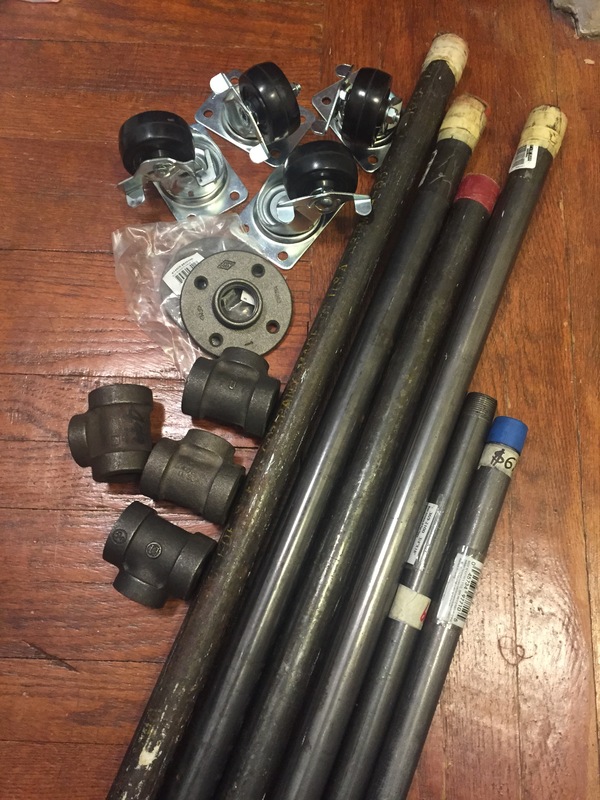 The pipes needed a thorough cleaning, and then they were ready for assembly. 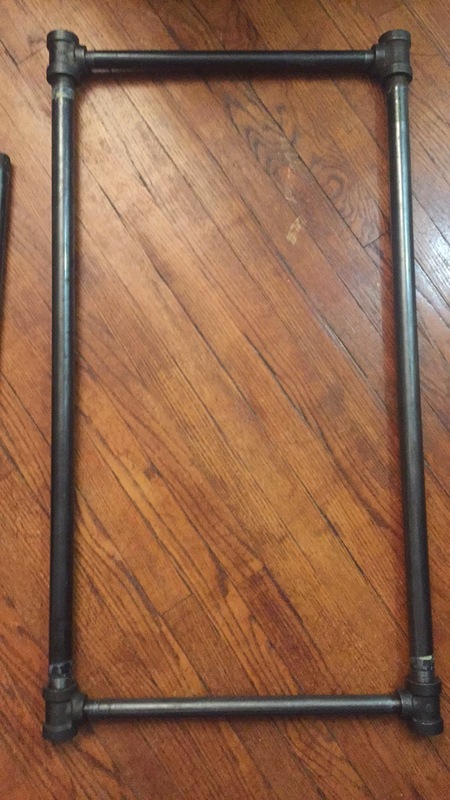 I started with the top bar: an 18″ pipe with two tee connectors. Then I screwed in a 36″ pipe to each tee. As I’d learned, the next part was tricky: attaching the middle bar. I started off by adding a tee to the end of one of the long pipes. Into that tee, I added the second 18″ pipe. Then I screwed the final tee into the long pipe and lined the middle bar up to it. 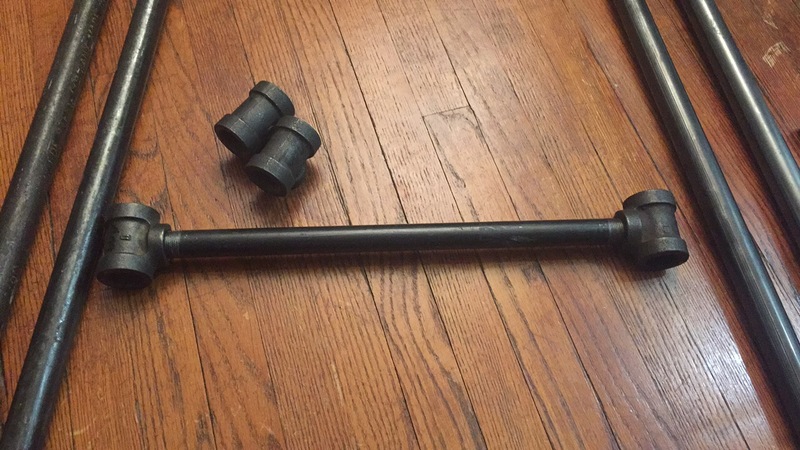 I unscrewed the 18″ bar from the left in order for it to be screwed into the tee on the right (hard to explain in words, but easy to understand when you’re doing it). I guess this is the part where I got too excited building something to remember to take pictures, but the remaining steps involved screwing the last two 36″ pipes into the tees, and adding the floor flanges. I had to stand it up, lay it back down, and fiddle with it few times to get it to stand up without being held (especially since the floor is a little uneven in the closet), but I eventually got it worked out. I wasn’t able to find a piece of wood in the dimensions I’d like for the bottom support and casters, so there’s still a part II to come. But that didn’t stop me from putting it in place and hanging clothes on it! In order to get the clothes to hang properly with the rack in place, I needed to move the shelf that was already in the closet. It was just made up of two pieces off 1 x 12 wood (which weren’t nailed down), so it was very easy to move one to the upper support. Now I just have to install the shelving unit I bought on the wall behind it. And maybe spray paint the pipe garment rack so it doesn’t look so industrial. 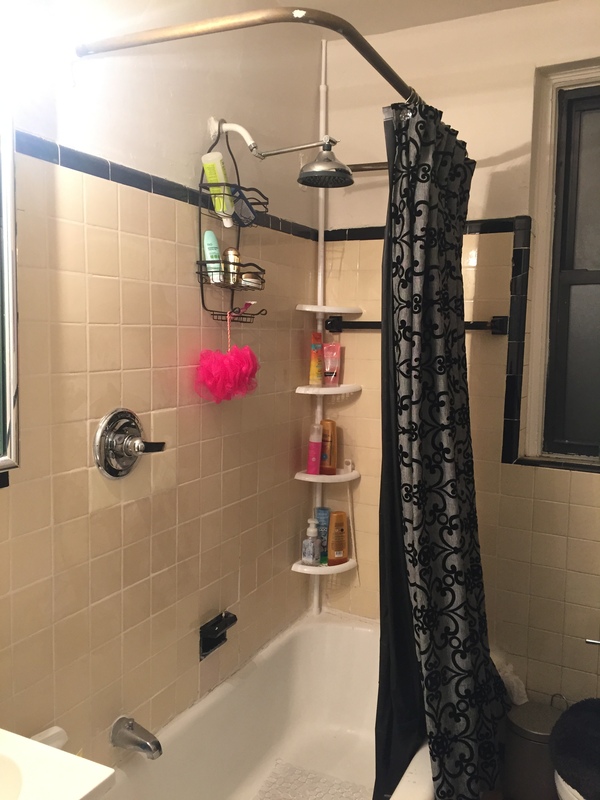 My old apartment had a small shower stall, so I bought a hanging caddy for over the shower head. I had more toiletries than it held, so some bottles were placed on the shower floor. But my new bathroom has a tub! Also, the shower head is mounted higher, making access to the bottles difficult. 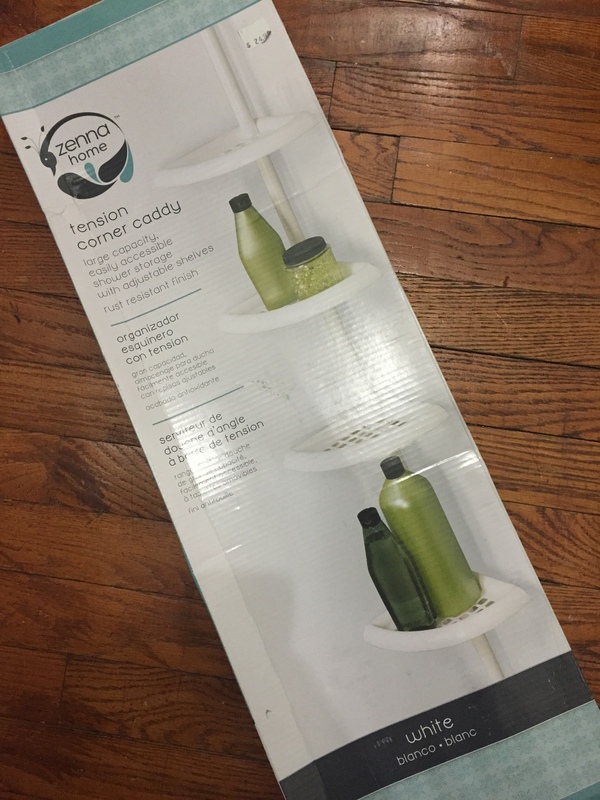 Corner shower shelf to the rescue! 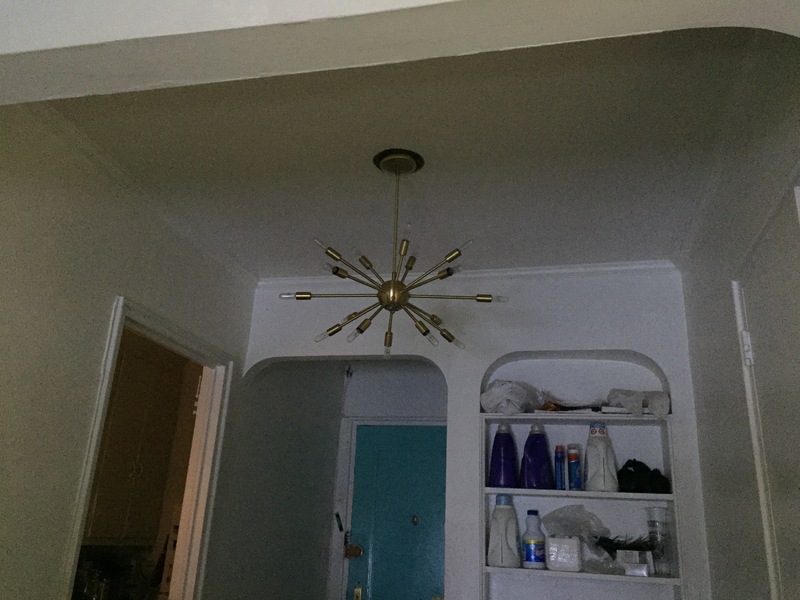 I measured the distance from the tub to the ceiling, and it came to 86″. A hardware store around the corner from me was going out of business, and everything was half-off! This white shower shelf seemed perfect, was $13, and fits ceilings up to 96″. The assembly was very easy, and I couldn’t wait to put it in place…only to find that it was a few inches too short! It comes with an extra short piece, but when that piece was added on, it was impossible to get the shower caddy in place (the internal spring is very strong!). The instructions say for $6 and a call to their 800-number, I could get another short piece delivered right to my door. Simple enough, and still less than the cost of other shelves I’ve seen. Plus, I couldn’t return the shelf since it was purchased during their “going out of business” sale. Two days later, the extra piece had arrived. Two short pieces in place of one of the long pieces was exactly what I needed! Now the shower shelf goes all the way up to the ceiling! PS. Obnoxious post title courtesy of this song.